(Photo courtesy WCSM radio) Brady Wilson, a Wright State University Lake Campus student and member of the diversity committee, helped to count and box the books collected for the Literacy Drive hosted by faculty, staff and students at the Lake Campus. 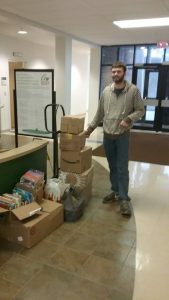 Wright State University–Lake Campus faculty, staff and students participated in WSU-Lake Campus Annual Literacy Book Drive. This annual event sponsored by the Lake Campus Diversity Committee is a Lake Campus tradition. The three-week event started on January 22 and continued through February 12 and honors the life and mission of Dr. Martin Luther King, Jr. All donations are from faculty, staff, students, and student organizations. Over 790 books were donated. Student workers and Lake Campus Diversity Committee members volunteered to count and box the books. The books were also delivered by Committee members. Donated books were delivered to C.A.L.L. Food Pantry, Mercer County Family & Children’s Services, Our Home, and Mercer County Senior Citizens in Celina, Ohio for distribution. All the donations as well as the support provided towards the book drive are greatly appreciated by those working within the Diversity Program at the Lake Campus. They extend a gracious thank you to all who helped make this year’s drive a success.